As the National Association of Manufacturers (NAM) eagerly anticipated the June 1947 enactment of the anti-union Taft-Hartley law, they were also celebrating another, less well-remembered victory over labor. In May, the Office of Price Administration (OPA), which had regulated prices of consumer goods during and after World War II, had closed its doors. The closing of the OPA immediately hit working-class pocketbooks. The cost of living went up 5.5 percent in the next month, and by September the cost of meat — a status symbol, made newly affordable for many working-class families by union wages and OPA price controls — had doubled. 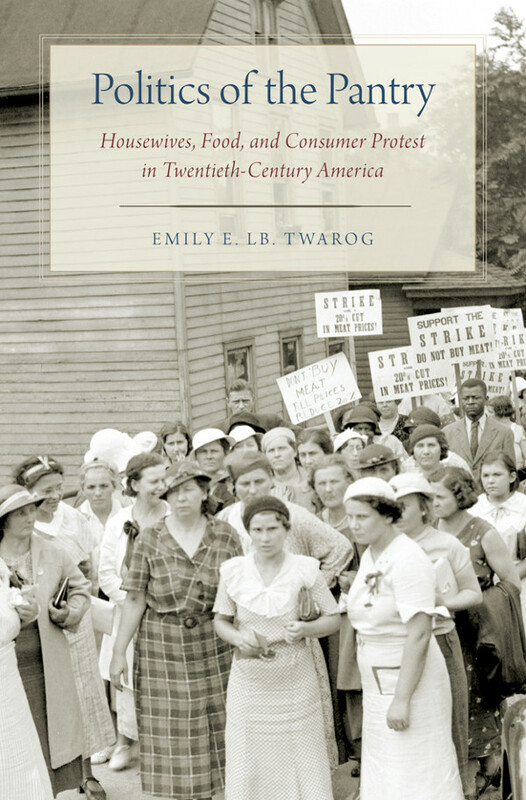 A new book by labor historian Emily E. LB. Twarog, Politics of the Pantry, tells the story of how working-class women throughout the twentieth century created a “domestic politics” that “highlights the inextricable links between labor, community, home and the market.” Women staged boycotts they at times called “meat strikes” to protest high prices, lobbied politicians, worked with government agencies like the OPA—and in the 1930s and 40s, organized militant “Women’s Auxiliaries” of the new CIO unions, including the UE. 400 of Hamtramck’s Polish working-class housewives—accompanied by some of their husbands—met at the Polish Falcon’s Hall to take action against the cost of meat and other domestic goods, such as milk and heating fuel. By the end of the evening, neighborhood women had mapped out a boycott campaign with both local and national dimensions. Their strategy was slow escalation … In their letter to President Franklin Delano Roosevelt and Secretary of Agriculture Henry Wallace, they criticized national agricultural policies and “demand[ed] action to reduce the cost of living.” … The housewives told local butchers that if they did not lower meat prices, the housewives en masse would boycott their shops. Zuk was elected chair of the Committee for Action against the High Cost of Living. Within a month, German, Jewish, African-American and other communities in Detroit had joined the “meat strike,” and it was endorsed by the Detroit Federation of Labor. Zuk led a racially-integrated delegation to Washington, DC to meet with Secretary Wallace, which generated national media attention and helped to prompt a federal investigation into meat prices — albeit one that met behind closed doors. Meat boycotts spread throughout the country that summer, but eventually faded. Twarog reports, “[w]hile the demand of a 20 percent price reduction was never met, neighborhood butchers were pressured through the boycott to lower their prices.” Zuk’s activism in the meat boycott led her to join the Hamtramck People’s League, a local political party affiliated with the Michigan Farmer Labor Party. Working with UAW Local 229, which was organizing workers at the huge Dodge Main plant in Hamtramck, and UAW organizer Stanley Nowak, Zuk successfully won a seat on the Hamtramck Common Council in 1936, as part of a progressive, pro-labor slate. Through their affiliation with the CIO, auxiliary members were also part of an organization that had the national clout to contest decisions made in Washington, DC, as when the CIO conducted independent research to challenge the official Bureau of Labor Statistics numbers on which OPA policies were based. Auxiliary members both carried out policies on the front line, and, through organization, provided a grassroots counterweight to policy-makers in DC. Rather than embracing the auxiliaries’ domestic politics approach, CIO unions—such as the UAW—cut support for women’s auxiliaries after the war, essentially putting a halt to effective consumer organizing. Schakowsky remembers that they “push[ed] the stock boys against the shelves … [to] make them tell us how they knew to rotate the [stock].” To avoid the sale of potentially expired goods, the women stabbed pencils through packs of bologna and loaded up carts of expired foods to deliver to the store manager. Twarog closes her book with a lament that the feminist movement of the 1970s, in their rebellion against being forced into being “housewives,” overlooked the progressive domestic politics created by women who used their very status as housewives as a way to organize. In doing so, Twarog writes, the women’s movement alienated many working-class women and ceded “kitchen-table politics” to conservative, anti-labor politicians whose economic policies actually made it harder for housewives to feed and clothe their families. UE Women’s Auxiliaries — like UE — were also unafraid to take bold stances on the issues of the day. In addition to working on consumer issues, UE Women’s Auxiliaries worked for a national health program and investment in public housing, and took positions on issues of war and peace. The only effective way to prevent profiteering and price rises is for the Congress to pass the right kind of law forbidding price increases and for the President and all his law-enforcement officers to enforce that law. By this we mean, that when the large corporations and all their outlets have the choice between going to jail or halting price rises, then they will stop profiteering—and not before!